If the HSA owner's surviving spouse is the designated beneficiary, the surviving spouse becomes the HSA owner. Consequently, he or she completes Form 8889 for transactions occurring after the HSA owner's death. If the HSA owner has designated a non-spouse beneficiary and dies, the HSA ceases being an HSA. If the inheriting beneficiary is not the HSA owner's estate, the beneficiary completes Form 8889 as follows. Across the top of the form write, “Death of HSA Owner. If the beneficiary pays within one year of the date of death medical expenses incurred by the HSA owner prior to his or her death, then such amount is to be listed on line 15. At times the beneficiary may need to file an amended tax return. If the inheriting beneficiary is the HSA owner's estate, the final tax return and Form 8889 for the HSA owner as follows. On line 14a the HSA fair market value as of the date of death is inserted. This amount is included on the deceased HSA owner's final tax return for the year he or she died. This is true even if the personal representative withdraws the funds in a following year. If the estate pays within one year of the date of death medical expenses incurred by the HSA owner prior to his or her death, then such amount is to be listed on line 15. At times the final tax return for the deceased HSA owner may need to file an amended tax return. There are two times when a person is apparently required to file a paper tax return (versus an electronic filing) and file multiple 8889 forms. An HSA custodian is required to prepare and furnish Form 1099-SA (Distributions from an HSA, Archer MSA,or Medicare Advantage MSA) to report distributions received by the HSA owner or an inheriting HSA beneficiary. The individual will use the information from the Form 1099-SA to complete their federal income tax return, including Form 8889 (Health Savings Accounts).The individual explains on this form whether all distributions were used for qualified medical reasons and so they are tax-free, whether some of the distributions are taxable since they were not used to pay a qualified medical expense, or whether some distributions are not taxable since they were the withdrawal of an excess contribution. The IRS takes the reporting of the withdrawal of excess HSA contributions very seriously. Reason code 2 is to be inserted in box 3 of Form 1099-SA when an HSA owner withdraws an excess contribution. The amount of the earnings, if any, associated with the excess contributionis to be reported in box 2. The IRS procedures applying to the withdrawal of HSA excess contributions are very similar to the rules applying to the withdrawal of excess IRA contributions, but there are some significant differences. Excess HSA contributions can cause tax problems for an HSA owner, but they also cause administrative problems for the HSA custodian/trustee. The purpose of this article is to discuss the tax rules applying to excess HSA contributions so that an HSA custodian will properly perform its IRS reporting duties and also help its HSA owners. The HSA custodian/trustee may well want to have the authority to charge an administrative fee for the additional work which will need to be performed on account of the excess HSA contribution(s). This approach is imprudent as it relies on wishful thinking. This approach is contrary to IRS guidance. The IRS may assess a fine of $50 for each Form 1099-SA prepared in error . If the IRS concludes that an HSA custodian has failed to provide a correct Form 1099-SA due to its intentional disregard of the requirement to furnish a correct Form 1099-SA, then the penalty is at least $250 per form with no maximum penalty. The $250 perform penalty may be assessed twice – once with respect to the copy required to be filed with the IRS and also with respect to the copy to be furnished the HSA owner. Who is primarily responsible for correcting an excess HSA contribution? The HSA owner is, but in some situations the HSA custodian must be proactive in making sure the excess contribution is corrected. It is the HSA owner who must pay the 6% excise tax if excess contributions have been made to his or her HSA and they have not been with-drawn by the tax filing deadline. Normally, this is April 15 of the following year. A special tax rules modifies the deadline to October 15 if the individual filed his or her tax return byApril 15 and paid any taxes owing. The 6% tax applies for each year the excess remains in the HSA. The HSA plan agreement provides that the HSA custodian is NOT authorized to accept annual contributions totaling more than $7,450 for 2013 and $7,550 for2014. This amount is the family HDHP limit plus$1,000. This provision means the HSA custodian must be proactive in correcting excess contributions which have arisen because the individual and the employer contributed more than this limit. Both the individual and the institution have done something they should not have done. The individual made the excess contribution and the institution should not have accepted it. HSA custodians must have a procedure to monitor (and enforce) the $7,450/$7,550 limit. In order to illustrate some of the administrative issues which may arise from an excess HSA contribution situation, two situations will be discussed. Situation #1. 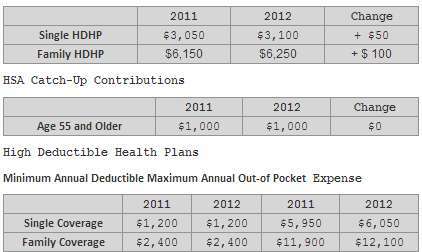 Sue Taxpayer, age 39, contributed $6,450 to her HSA on April 1, 2013 for 2013. At that time she thought she had family HDHP coverage for allof 2013. However on July 1, 2013, she went to work for a new employer which covered her immediately under a non-HDHP. Thus, she was eligible to contribute only $3,125 to their HSA and so she needs to withdraw her excess contribution of $3,125 plus the related income, if any. In January of 2014, Sue visits the HSA custodian and states she needs to withdraw $3,125 as an excess HSA contribution plus the related income. The HSA custodian must assist her. The withdrawal cannot be coded as the withdrawal of a normal HSA distribution. Note that even though this distribution relates to a 2013 distribution, it will be reported on a 2014 Form 1099-SA. The rule is – the income, if any, withdrawn and shown inbox 2 is taxable for the year withdrawn (2014) and not 2013 which is the IRA rule. Situation #2. John Taxpayer contributes $14,000 to his HSA in 2013 for 2013. He says he was unaware of any contribution limit. His beginning balance as of January1, 2013 was $600. He made monthly contributions of$1,000. His HSA’sending balance as of December 31,2013 was $200. His distributions for the year totalled $14,400. Of this $12,400, John knows that $8,800 was used to pay qualified medical expenses and the remaining $5,600 was used to pay the premiums for the HDHP. The institution does not know how John used the funds. The HSA custodian has initially coded all of the HSA distributions as being normal HSA distributions and a code “1” would be inserted in box 3 on the 2013 Form1099-SA. The HSA custodian, however, knows that John made excess contributions of at least $6,950 ($14,000-$7,450). This amount is no longer in the HSA as it only has a balance of $200 at year end. Whether John knew it or not, when he took a distribution he was withdrawing an excess contribution. The HSA custodian cannot continue to report this amount as the withdrawal of a normal distribution. It must change some of withdrawals to show that he withdrew $7,950 as an excess contribution, plus the earnings, if any. Be aware that the IRS has not furnished specific guidance on Situation #2. The IRS should do so. Note that John used the funds to pay the premiums for the HDHP. As discussed in a previous newsletter article, if he had taken a normal distribution he would have had to include the $5,600 in income and also pay the 20% penalty tax as the funds were not used to pay a qualified medical expense. But he does not have such adverse tax consequences as he withdrew an excess contribution. An HSA custodian must adopt procedures to properly report the withdrawal of an excess HSA contribution(s). Such withdrawals must not be reported as normal distributions.